Why Study Nitrogen Recovery from Manure? Significant efforts are required to abate NH3 emissions from livestock operations. In addition, the costs of fertilizers have rapidly increased in recent years, especially nitrogen fertilizer such as anhydrous ammonia which is made from natural gas. Thus, new technologies for abatement of ammonia emissions in livestock operations are being focussed on N recovery. This presentation shows a novel system that uses gas-permeable membranes to capture and recover ammonia from liquid manure, reducing ammonia emissions from livestock operations, and recovering concentrated liquid nitrogen that could be sold as fertilizer. 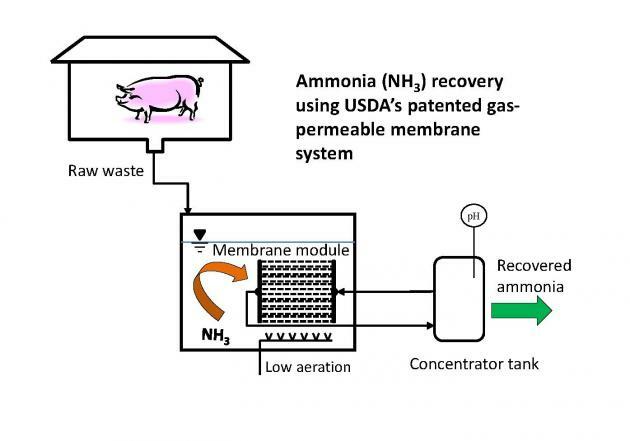 Nitrogen recovery from swine manure was investigated using a new technology that uses gas-permeable membranes at low pressure. The new process includes the passage of gaseous ammonia contained in the liquid manure through a microporous hydrophobic membrane and capture and concentrate with circulating diluted acid on the other side of the membrane. The membranes can be assembled in modules or manifolds. Membrane manifolds are submerged in the manure and the ammonia is removed from the liquid before it escapes into the air. The process involves manure pH control to increase ammonium recovery rate that is normally carried out using an alkali chemical. In this study a new strategy was tested to avoid the use of alkali chemicals. Instead of the chemical, we applied low-rate aeration and nitrification inhibitor to raise the pH and promote ammonia capture by the membrane system. Two studies were conducted to recover N from liquid swine manures containing high ammonia concentrations using a USDA patented gas-permeable membrane system. One study used raw liquid manure from the pit under slatted floor of a farrowing sow’s barn in Segovia, Spain. The second study used liquid swine manure effluent from a covered lagoon digester in North Carolina, USA. The new strategy that used low-rate aeration and nitrification inhibition worked quite well in both situations. In the first study using raw manure, the pH increased and the ammonium concentration was almost depleted: it declined from 2270 mg N/L to 20 mg N/ in 18 days. The ammonia that was removed was recovered efficiently in the concentrator tank (99% recovery efficiency). Using the same membrane manifold without the aeration protocol, the ammonium concentration in the manure decreased at a slower rate from 2330 mg N/L to 790 mg N/L in 18 days. The results obtained were consistent in the second study that used digested swine effluent. When low-rate aeration and nitrification inhibitor were added to the gas-permeable membrane reactor, ammonium concentration in the digester effluent decreased rapidly, from 3130 mg N/L to 96 mg N/L, in 5 days. The recovery efficiency was 98%. This N removal rate was 5 times faster than a control that used the same membrane reactor and conditions but operated without the aeration protocol. Overall results obtained in this work indicate the low-rate aeration is an economical alternative to chemical addition to increase ammonia availability and the capture of ammonia by gas-permeable membrane systems. This conclusion is supported by the very high removal and recovery efficiencies obtained resulting in an overall recovery of 95 to 98% of the initial ammonia in the manure. On-farm demonstration studies will be conducted in 2015 in cooperation with Dr. John Classen, North Carolina State University, through an NRCS Conservation Innovation Grant (CIG) “Ammonia recovery from swine wastewater with selective membrane technology”. A mobile pilot unit will demonstrate recovery of ammonia from liquid manure effluents using the gas-permeable technology in three different manure collection systems: under floor belt system, scraper system, and anaerobic digester. Vanotti,M.B., Szogi,A.A. “Systems and Methods for Reducing Ammonia Emissions form Liquid Effluents and for Recovering Ammonia”. US Patent Appl. SN 13/164,363, filed June 20, 2011, allowed December 19, 2014. US Patent and Trademark Office, Washington, DC. This research was part of USDA-ARS National Program 214 Agricultural and Industrial Byproducts, Research Project 6657-13630-005-00D “Innovative Bioresource Management Technologies for Enhanced Environmental Quality and Value optimization”. Funding by INIA/FEDER Project CC09-072 is gratefully acknowledged.